There is an additional U.S. Navy Days Surprise on the TAB above! In this example we want to use the Boolean (OR) feature '/' in order to play the appropriate Ships Bells every half hour. To do this, we have you create a Tasker Time Context Profile which repeats every half hour. Note: First, download the ‘Ships Bells’ file and extract the Ships Bells Sound files to your phone's sdcard in a folder named, ‘NavyDays’. (Example: sdcard/NavyDays). Also, you may download this 'U.S. 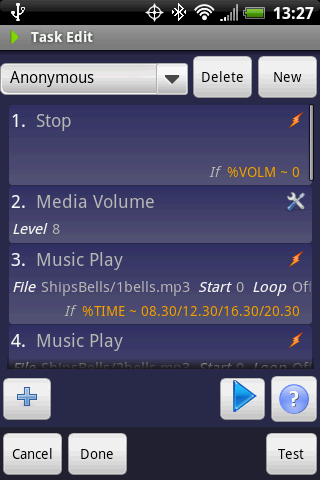 Navy Days (Ships Bells Only)' Tasker Profile file and load this Profile's Data automatically into Tasker using Tasker's 'Import Profile From SD' feature. 2. If Tasker is not in ‘Context Selector Mode’ click 'New' then select 'Time'. If you are in ‘Context Selector Mode’ click the 'Clock' on the top button bar and then click 'New'. 3. On the Time Context window, change the ‘From’ time to ‘06 00’, and change to ‘To’ time to ’22 00’. 4. Now select ‘Repeat’ and enter ‘30’ in the text box and select ‘Minute(s)’ from the drop down list. Create a list of ‘Actions’ to perform on the ‘Task Edit’ screen for the ‘Ships Bells’ Profile. First, we need a handler so that if you have your phone's media volume muted, you won’t hear anything which might be annoying to other people if you are in a meeting or on a conference call. 1. Click ‘+’ and select ‘Tasker’ and then click ‘Stop’. 2. Under the ‘IF’, enter ‘%VOLM’ in the text box and ‘0’ in the last text box. Then click the ‘-‘ and select ‘Matches’. Second, we need to set the Media Volume level to an acceptable level for your experience. 1. Click ‘+’ and select ‘Audio’ and then click ‘Media Volume’. 2. Change the ‘Level’ slider to a level that is acceptable to you. I use a level of ‘8’. Third, we need to create the task that will play the appropriate Ships Bells that were downloaded above. 1. Click ‘+’ and select ‘Media’ and then click ‘Music Play’. 2. ‘Long-Click’ the ‘File’ field and browse your sdcard and select the ‘sdcard/NavyDays/1bells.mp3’ file. 3. Under the ‘If’, enter ‘%TIME’ in the text box and ‘08.30/12.30/16.30/20.30’ in the last text box. Then click the ‘-‘ and select ‘Matches’. 2. ‘Long-Click’ the ‘File’ field and browse your sdcard and select the ‘sdcard/NavyDays/2bells.mp3’ file. 3. Under the ‘If’, enter ‘%TIME’ in the text box and ‘09.00/13.00/17.00/21.00’ in the last text box. Then click the ‘-‘ and select ‘Matches’. 2. ‘Long-Click’ the ‘File’ field and browse your sdcard and select the ‘sdcard/NavyDays/3bells.mp3’ file. 3. Under the ‘If’, enter ‘%TIME’ in the text box and ‘09.30/13.30/17.30/21.30’ in the last text box. Then click the ‘-‘ and select ‘Matches’. 2. ‘Long-Click’ the ‘File’ field and browse your sdcard and select the ‘sdcard/NavyDays/4bells.mp3’ file. 3. Under the ‘If’, enter ‘%TIME’ in the text box and ‘06.00/10.00/14.00/18.00/22.00’ in the last text box. Then click the ‘-‘ and select ‘Matches’. 2. ‘Long-Click’ the ‘File’ field and browse your sdcard and select the ‘sdcard/NavyDays/5bells.mp3’ file. 3. Under the ‘If’, enter ‘%TIME’ in the text box and ‘06.30/10.30/14.30/18.30’ in the last text box. Then click the ‘-‘ and select ‘Matches’. 2. ‘Long-Click’ the ‘File’ field and browse your sdcard and select the ‘sdcard/NavyDays/6bells.mp3’ file. 3. Under the ‘If’, enter ‘%TIME’ in the text box and ‘07.00/11.00/15.00/19.00’ in the last text box. Then click the ‘-‘ and select ‘Matches’. 2. ‘Long-Click’ the ‘File’ field and browse your sdcard and select the ‘sdcard/NavyDays/7bells.mp3’ file. 3. Under the ‘If’, enter ‘%TIME’ in the text box and ‘07.30/11.30/15.30/19.30’ in the last text box. Then click the ‘-‘ and select ‘Matches’. 2. ‘Long-Click’ the ‘File’ field and browse your sdcard and select the ‘sdcard/NavyDays/8bells.mp3’ file. 3. Under the ‘If’, enter ‘%TIME’ in the text box and ‘08.00/12.00/16.00/20.00’ in the last text box. Then click the ‘-‘ and select ‘Matches’. Forth, we need to wait about six seconds for the Task to play the bells before setting your Media Volume back to an acceptable level for your experience. 1. Click ‘+’ and select ‘Misc’ and then click ‘Wait’. Note, you have to scroll the screen since ‘Wait’ is all the way at the bottom of this list. 2. Change the ‘Seconds’ slider to ‘6’. Finally, we need to set the Media Volume level back to an acceptable level for your experience. 2. Change the ‘Level’ slider to a level that is acceptable to you. I use a level of ‘15’. Now click 'Done', and then click 'Apply' to save this Profile. And here is an added surprise for any salty-dog who wants the ‘FULL’ experience of ‘Navy Days’! The FULL 'U.S. Navy Days' effect will do everything from Ships Bells, Reveille, Boatswain Whistles, Bugle Calls, National Anthem, Liberty Call, and Anchors Away. Needless to say it just does lots of nutty stuff for the avid U.S. Navy sailor or retiree in you. Here is what you will need to download. 1. Download the ‘U.S. Navy Days’ sound file and extract the Sound files to your phone's sdcard in a folder named, ‘NavyDays’. (Example: sdcard/NavyDays). 2. Download the ‘Sunset Task’ and to your phone's sdcard in a folder named, ‘Tasker/Tasks’. (Example: sdcard/Tasker/Tasks). 3. Download the ‘U.S. Navy Days Time Profile’ and to your phone's sdcard in a folder named, ‘Tasker/Profiles’. (Example: sdcard/Tasker/Profiles). 4. Download the ‘U.S. Navy Days (First Call) Time Profile’ and to your phone's sdcard in a folder named, ‘Tasker/Profiles’. (Example: sdcard/Tasker/Profiles). 5. Download the ‘U.S. 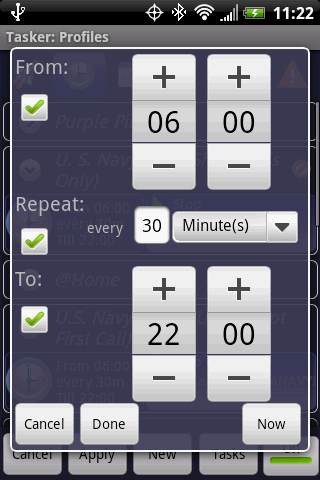 Navy Days (Evening Colors) Time Profile’ and to your phone's sdcard in a folder named, ‘Tasker/Profiles’. (Example: sdcard/Tasker/Profiles). 6. Download the ‘U.S. 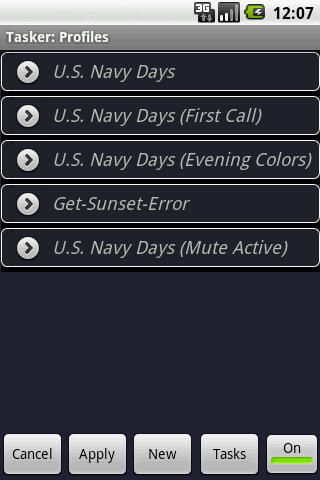 Navy Days (Mute Active) Event Profile’ and to your phone's sdcard in a folder named, ‘Tasker/Profiles’. (Example: sdcard/Tasker/Profiles). 7. Download the ‘U.S. 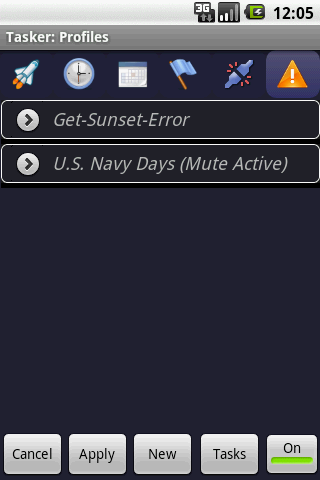 Navy Days Get Sunset Error Event Profile’ and to your phone's sdcard in a folder named, ‘Tasker/Profiles’. (Example: sdcard/Tasker/Profiles). First, I won't attempt to explain every detail of how the Navy Days Profiles work, but I will explain a few features found in the Navy Days experience. There are 'five' Profiles. 2. Notification Alerts, and Notification Cancel, including Task actions to take when Notification Alerts are clicked which includes running a Task. 3. A lot more Music Play Tasks. 4. Profile Task Stop Actions. 5. Variable Set, Variable Clear, Variable Add, Variable Subtract, and Variable Split. 6. HTTP Get with Variable Split to parse the %HTTPD received data for the specific information we need which includes Task stop error handling using Tasker's %HTTPR event variable. Tasker Profile files and Task files can be loaded automatically into Tasker using Tasker's 'Import Profile From SD' feature. 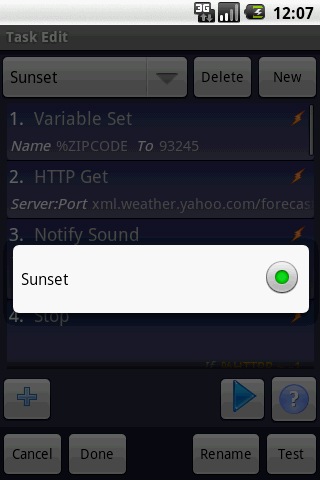 Note: You will need to change the Sunset Task's first Variable Set 'To' option to your local zipcode. 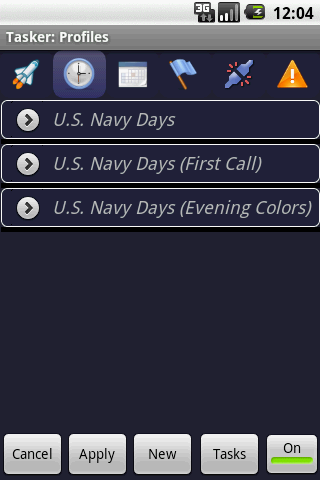 Now just run the Sunset Task for the first time and change the U.S. Navy Days (Evening Colors) to the time it notifies, and then just set back and Enjoy.